Following 1st Enfield Literary Festival in 27th January at Edmonton Green library and on the back of the Lamb’s festival at All Saint’s church, Edmonton from 16-22nd June, this really is the year in which we celebrate the Borough’s Literary History with an interactive month of Workshops and Lectures for all tastes including children and families. 08th June, Enfield, London: 2018 sees the first major Enfield Literary Festival, which celebrates the borough’s rich cultural and literary heritage. Taking place on 22-30th June 2018 at the Dugdale Centre, Enfield. “Opening Books” with award-winning best selling authors, from children's to adults, packed full of workshops, a literary walking tour of Enfield, talks about Keats, Charles and Mary Lamb. Highlights will include local school children from across Enfield participating in the festival with poetry readings, developed in collaboration with local poets celebrating creative schools poetry projects. It will start on 22nd June from 5pm and run through to 30th June finishing at 10pm. The festival will comprise of a series of lectures and workshops with the majority of the tickets on sale at £5 per person at the Dugdale Centre box office. For details of the programme see here. Famous literary icons from Enfield include: Charles and Mary Lamb, John Keats, Florence Dugdale, Walter Pater, Gregory Motton, Jim Crace and Isaac Israeli. Awarding winning and best selling author of ‘In A Cottage In A Wood’ Caroline Green; young adult fiction writers, award-winning authors of ‘Orange Boy and Indigo Donut, ’Patrice Lawrence and Catherine Johnson author of ‘Sawbones, The Curious Tale of the Lady Caraboo’; Sci-fi writers Allen Ashley, author John Lucas talks about gangs in his novel ‘Turf,’ author and former BBC journalist, Kurt Barling will be speaking among other works, about his book the ‘R’ Word’; enjoy national celebrated poet accompanied with music Roger McGough and & Little Machine. And reading for Poetry Night, includes Katherine Gallagher and Sonia Jeramas. Along with workshops for children and adults, that include children's writers Alex Woolf and Dee Shulman, plus talks on Keats by Linda Carey from Keats house and lectures by the Lamb Society, a literary walking tour of Enfield with Jay walk, there is truly something for everyone. About the speakers and events please read details on the festival’s programme found here. Enfield’s poem-a-thon successfully raised funds at the Dugdale Centre, for the Enfield Refugee Welcome, the first Community Sponsorship group in the country to offer an opportunity of a new life to a family of refugees through the vulnerable Children’s Resettlement Scheme. 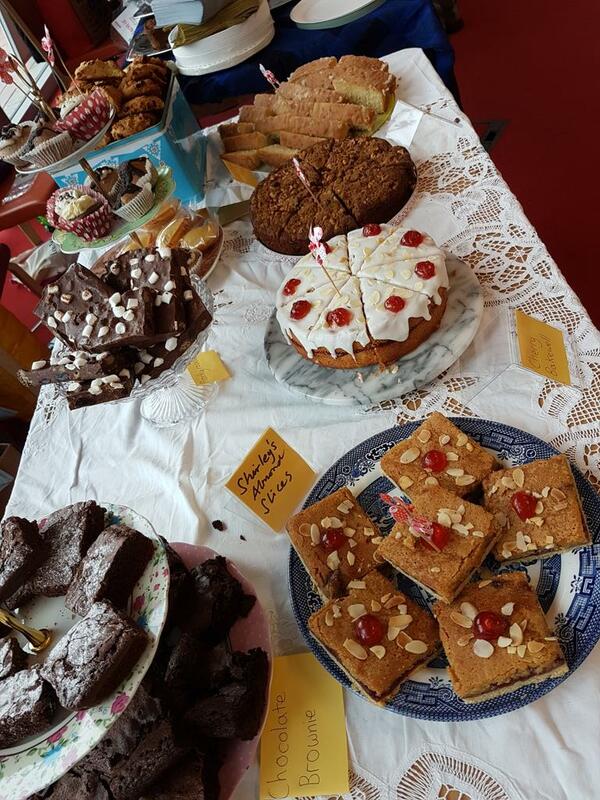 Packed full of poets and an appreciative audience, the event had already surpassed its target of £9000 before it had even finished and cakes helped to fuel both poets and the audience.